Where does foot golf come from? Foot golf has not yet fully reached its potential in Switzerland as a ball sport, however it is one of the most rapidly growing sports in the world. Foot golf was first developed by FC Barcelona player, Manuel Asensi in 2006. Foot golf combines golf and European football (soccer). 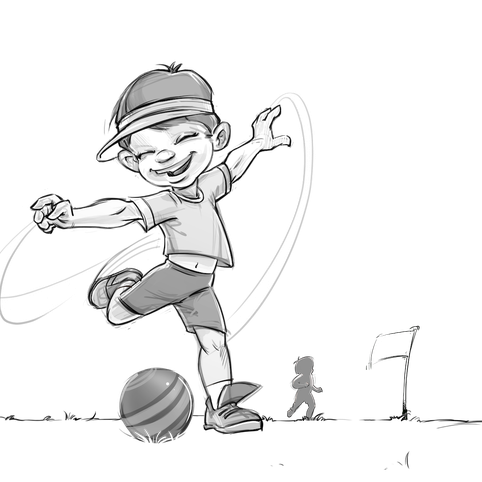 The ball played is a normal soccer ball and the goal is to you use your foot to hit the ball, with as little kicks as possible (as in golf), into the holes on a small golf course. Different from a normal soccer field, you have to be able to move around different hazards including trees, walls and hilly terrain to get your ball to the goal. The best soccer player will not necessarily be the best foot golfer, so foot golf is the ideal sport for everyone, young and old! The whole family can play together, regardless of skill or age. Come by and show us your fancy footwork! The goal of the game is to kick, with as little turns as possible, the ball into correct foot golf holes. The ball is hit directly with the foot directly from the ground. Every touch of the ball is counted as a turn. For every hole there is a prescribed amount of shots in which a skillful player could reach the goal of getting the ball in the hole from the kick-off area, this is the par number. The game begins with the players taking one rotating turn kicking their individual ball towards the goal. A new round begins with the person whose ball lies furthest away from the hole. Should a ball lie in the way of another ball, the player can mark the ball's place so that the blocked ball is free to play. After the ball is played, then the removed ball will return to the marked place. The first persons who get their ball in the hole wait until all players in the group have also successfully gotten their balls in the hole and then move to the kick-off place for the next hole together in one group. The winner is the player who has the smallest amount of shots for successfully hitting the ball in all 6 holes (as in mini-golf).